Fresh Herby Sauce, aka Chimichurri is a versatile sauce that can be made ahead and then tossed on anything to really boost the flavor. Veggies, Pasta and any protein. Works great as a dipping sauce for breads too! We used to go to a restaurant in LA that would serve the best dipping sauce. They called it a chimichurri. It was full of parsley, garlic, olive oil and some red pepper flakes. They served it as a dip to slices of bread. It was scrumptious. Seriously, the herby sauce, was served when you sat down and you would inhale it. Then your meal would come and you would be full because you couldn’t stop eating it. I have been craving this herby sauce because it’s freshness and flavorful taste sensations. Everytime I went to eat at that restaurant I always thought this sauce would be amazing on all sorts of things. 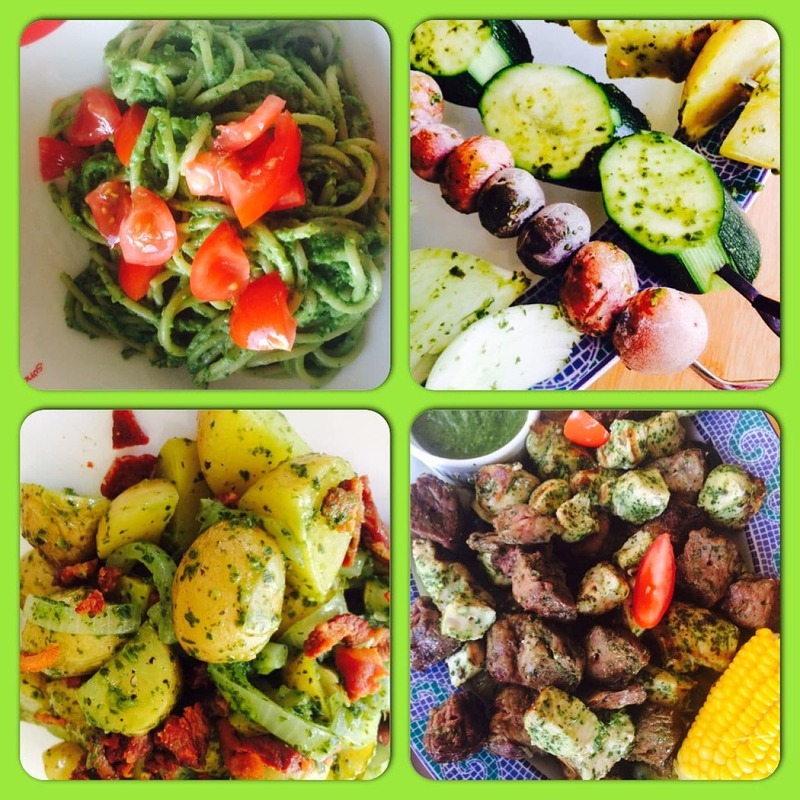 A simple pasta toss, a marinade for kebobs or any thing you want to grill, over vegetables…… I have so many great options for things to toss it since so many vegetables are in the peak of their season. While the chimichurri sauce’s exact history is unknown it is generally accepted that it came from Argentina. Some swear it is all parsley based while others say it is cilantro based. In Argentina they use it on all of the grilled meats they are famous for. It’s so easy to make, you just toss everything in a Food Processor and blend for a few minutes. Then you let it ruminate in your fridge for the flavors to meld into tangy, herby, garlicky goodness. Try this recipe with whatever you’re grilling tonight! Easy/Hard: The hardest part about this recipe is waiting for the flavors to meld before eating it. It does require some special equipment (food processor preferably, although a blender will work too.). 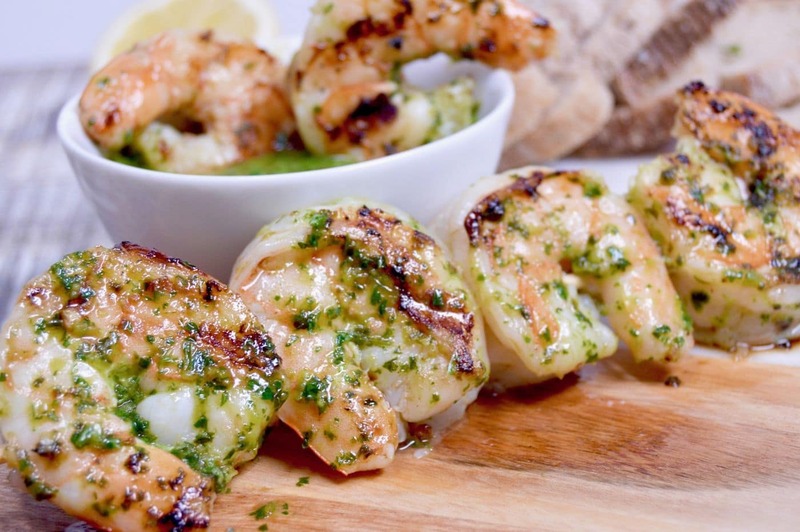 Serving Suggestions: I have used it as a dipping sauce for my gruyere risotto balls, as a marinade for grilled shrimp like I have pictured here in the post. It also works really well with this Crockpot Roasted Chicken from Kylee Cooks. I had some leftover chicken, served it in tortillas with the herby sauce as a salsa! You have to make the Crockpot chicken… it is so moist and fall apart tender you won’t want to make it any other way! Fresh Herb Sauce, aka Chimichurri is a versatile sauce that can be made ahead and then tossed on anything to really boost the flavor. Veggies, Pasta and any protein. Works great as a dipping sauce for breads too! Let sit for about 15 minutes to let all those flavors meld together. The caloric info for this recipe was calculated using my fitness pal using the specific brands/products that I purchased to make this. If you are following a strict regimen, please calculate the info using your purchases for accuracy. It’s true! You can really put chimichurri sauce on everything! I’m kind of intrigued about the fact that you dipped gruyere risotto balls in it. Such a versatile sauce! This looks fantastic! I am such a fan of chimichurri sauce, but amazingly, I haven’t made it in a while! Your beautiful post is just in time for the shrimp i purchased at the market today. We’ll be grilling them up with your sauce tomorrow. And, I’m totally with you on the bread for dipping. There’s a fresh loaf of ciabatta on my counter and I’m not sure I’m going to be able to control myself once the chimichurri is on the scene too, haha. This sauce sounds awesome – I like how versatile it is both with herbs and with what it could be used for. Oh, and those shrimp look so yummy! Its such a versatile sauce…. I think you will love how many things it will work with! Yum yum yum! I absolutely LOVE chimichurri sauce. I would drizzle it over pretty much anything if I could. It is just so versatile and packs a punch. I love how easy and simple your recipe is too. I love chimichurri sauce! This recipe looks delicious! I can’t wait to try it. I love that you dipped some shrimp in it! Mmm. 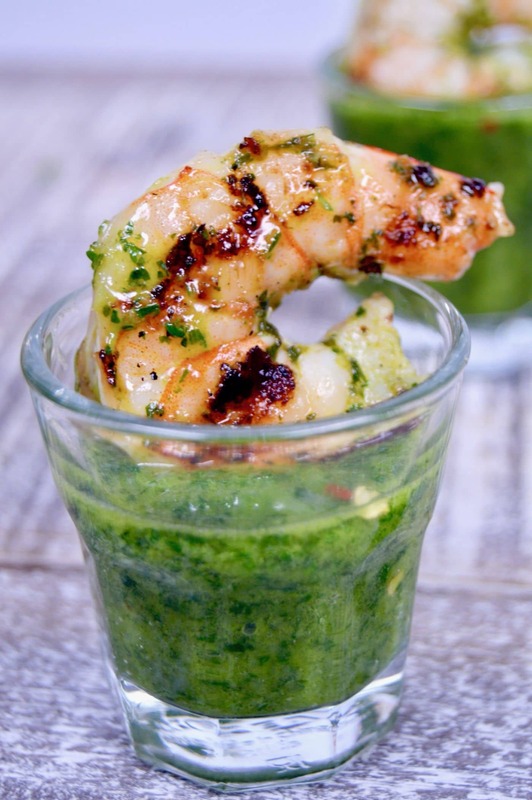 I love chimichurri, it’s such a beautiful, herby addition to any plate! Yours is so beautifully green and I love the red pepper flakes idea for it! I can’t wait to try yours out, yum! 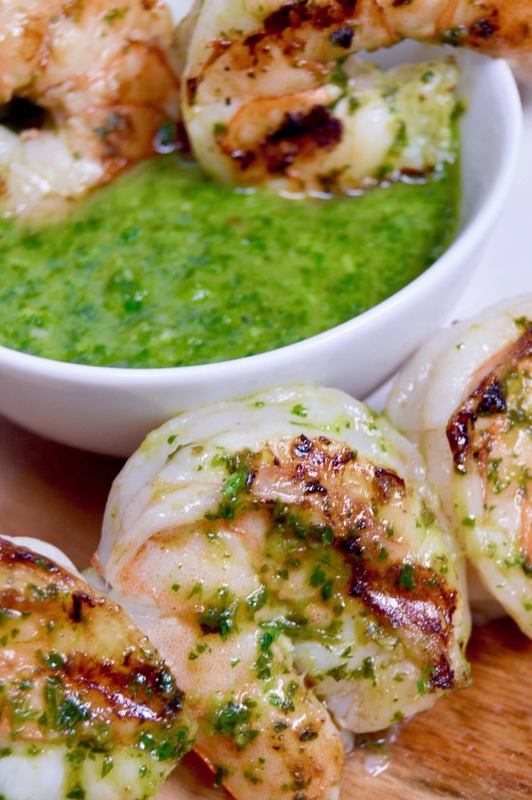 I’m just drooling reading about this chimichurri sauce, and those cooked shrimp are just calling my name. I can think of so many things to slather it on and it just screems summer to me with that beautiful green color. I love that you only used 1/2 cup of wine because that guarantees that I have a glass with whatever I can slather this sauce on! I love chimichurri sauce especially with lamb. I love love this sauce, tried to make it once and failed! Will save your recipe! 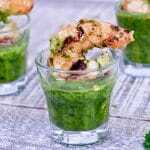 Such an easy recipe for a great dipping sauce! I had no idea these were that easy to make … will be whipping up some chimichurri this weekend! I love green sauces and am always looking for new ones. Looks delicious! This looks good! I think I should try this on salmon.